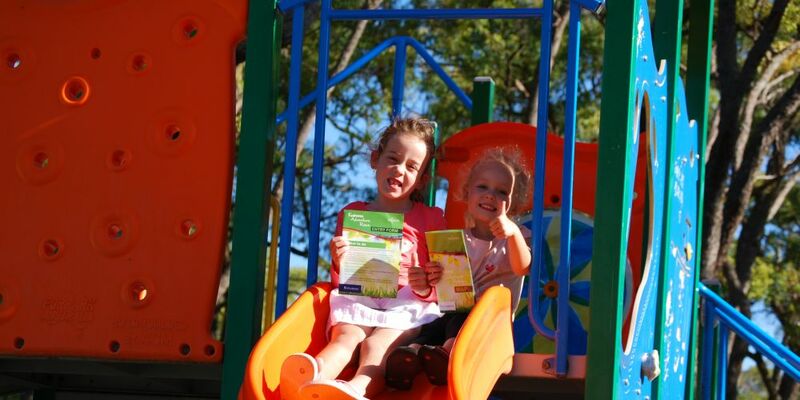 Milla (6) and Savanna Potsig-Sanders (4) at Rhodes Park Calista. CITY of Kwinana urges kids to leave their toys and electronics at home and experience the local playgrounds this month as part of Kwinana’s Adventure Race. The Kwinana Adventure Race will open for children up to 14 years old and will run from April 2 to April 30. Families will visit five or more local parks and answer a checkpoint question as well as participate in an outdoor challenge. Answers will be recorded on their entry form and placed in the drop box at the Kwinana Public Library by Wednesday, 9 May 2018, to have the opportunity to win a variety of prizes. Parks include the Kwinana Adventure Park, Bullrush Park Adventure Playground, Rhodes Park, Centennial Park and Wells Park. Mayor Carol Adams said families could get involved in what will be a fantastic chance to build a sandcastle, play a game of cricket or simply enjoy a picnic. “This is a perfect opportunity for families in Kwinana to experience our fantastic playgrounds, or even visit areas they otherwise would not have known about,” Cr Adams said. Entry forms are now available and can be collected from the Kwinana Public Library or go to www.kwinana.wa.gov.au/our-services/healthy-lifestyles/Pages/default.aspx.